A PEW poll shocks me. The question asks if you trust the federal government to do the right thing most of the time. 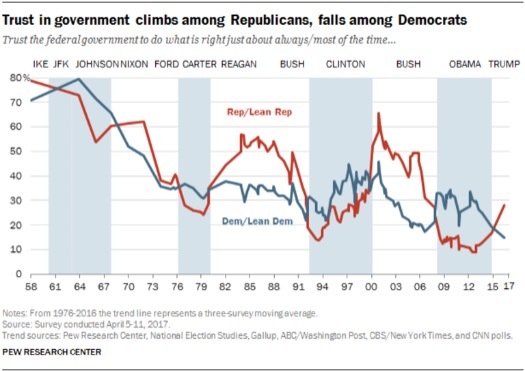 While Democrats and Republicans have swapped places several times for trustworthiness since I was a kid, the electorate is saying "a pox on both your houses". The average respect has plummeted from 75% in the late fifties to about 20% now. A marker of change can hardly be more bleak than this. Trump will be but the first in a line of populist leaders. Can this be part of the explanation? There is not a single congress person who writes legislation or laws. 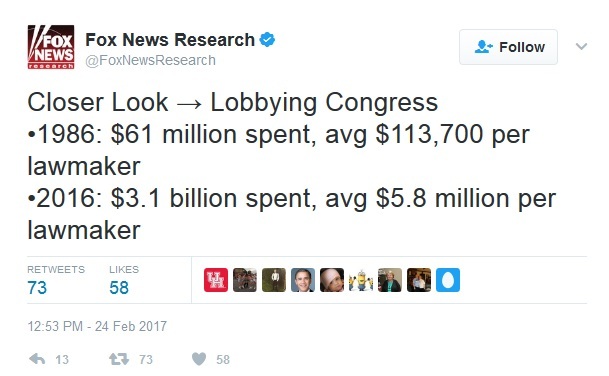 The people who hire the lobbyists do. 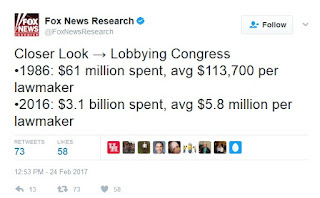 The number of congressmen divided by the amount invested in lobbying comes out at $5.8 million per lawmaker per year. Kenneth...It would be truly eye opening if we had a similar nation-wide poll done for the Canadian federal government. I think the results might prove that most Canadians are NOT in tune with our current administration!